Is anyone else entertained? Can you recall any male executive who was held accountable amidst all of the hoopla surrounding the global financial crisis in 2008? We had a crisis that resulted in the collapse or near collapse of large financial institutions, like Lehman Brothers or AIG; the federal bailout of financial services and large industrial companies, recall TARP and GM; downturns in the global stock market and the housing market; and widespread unemployment that reached and still remains at historic highs. Now answer this: is there anyone in America who can’t tell you who Ina Drew is? For those in a news vacuum this week Ina Drew and her team made some real mistakes at JP Morgan Chase, costing upwards of $2Bn in losses. But I can’t believe that one of the first people we call to task for financial misdeeds is a female executive, one of the few who comprise less than 8% of executives across the entire financial services industry. What about holding her boss Jamie Dimon accountable? Truth be told there were other women who took the fall for their male peers and bosses earlier in the financial crisis. Erin Callan, CFO of Bear Stearns, comes to mind. But, I digress. Can you tell that I spent a lot of time this week reading online news? While snooping around I happened upon a piece on WBUR’s CommonHealth site “When You Lose Your Sport, What Happens To Your Self?” by Carey Goldberg, former Boston bureau chief of The New York Times. 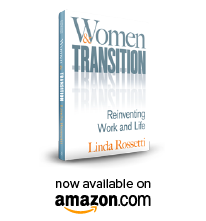 The story convinced me that we as a society don’t understand transition…either women’s or men’s. The story featured a clinical psychologist named Dr. Matthew Krouner of Brookline, MA who is offering a new type of group therapy for former ‘athletes.’ The doctor defines athletes in his literature as anyone who has played a sport, even a weekend warrior. Says Dr. Krouner “once you’re not able to do that anymore, even if it’s not a professional identity (READ: professional athlete), there’s a real sense of loss and a grieving that can take place.” Imagine that. As I was reading I got a little crazy and changed the words to ‘women’ or ‘our professional selves’ versus ‘sports’ or ‘athletes.” Do you see the parallels? Anna Fels, author of Novofemina’s Summer Book Review #8: Necessary Dreams observed, “that women in the midst of their adult lives, not men, are faced with continuous pressure to re-evaluate and reshape their lives – a process by which women create, realize, reconfigure and abandon goals.” I guess that is why Dr. Krouner is so fascinated by the athletes’ transition, few men ever traverse this terrain. Fels concludes that our challenges lie in the “absence of any maps or models with which to draw upon.” She relates this unchartered territory to the highly credentialed ‘status’ of women today versus women of only a generation or two ago. So where does this leave our 21st century role models? I have Len Schlesinger, president of Babson College, playing in my head…”it’s the one who defines the problem correctly who wins.” My Schlesinger-esque response is that we have role models all around us but we use the wrong filters to view them. They are tougher to see – these discontinuous, non-linear career models – because they don’t look like Jamie Dimon’s nor Ina Drew’s. In my transition I’m holding fast for a career with greater alignment across my various interests. My new work self doesn’t look or act like Ina Drew nor Jamie Dimon…but it used to. Many days I believe wholeheartedly that the easy road would be to just go out and get a job. But…I am inspired by the prospect of contributing to a new set of models. And, I am thoroughly energized by the work that I am doing. To date I would say of this new 21st century non-linear career world: the filters used to measure success are different but the hurdles are much higher. Sound daunting? We can’t let it be. Will you join me? This entry was posted in Observations on Transition and tagged AIG, Ana Fels, Babson College, Bear Stearns, career transition issues, Erin Callan, Ina Drew, Jamie Dimon, JP Morgan Chase, Len Schlesinger, Necessary Dreams, observations from a women's transition, On-Ramps and Off-Ramps, role models, TARP, women's issues, women's transition, women's transition issues. Bookmark the permalink.